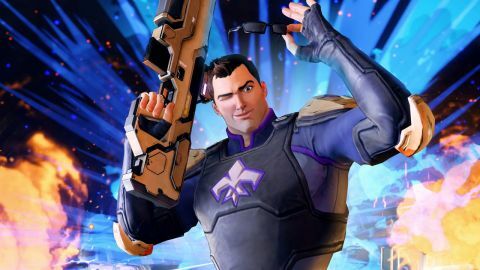 Agents of Mayhem review: "GI Joe, Saints Row, hero-swapping, and 'somehow, it all works'"
Agents of Mayhem is the M-rated comedy equivalent of watching GI Joe, playing with action figures, and joking around with friends. Its neon-bright world is established by animated cutscenes that evoke the low-budget vibe of merchandised-to-hell cartoons, and it's bridged by ridiculously inappropriate public service announcements from a diverse cast of characters. This game is proud to wear its influences like military medals while also mocking the scorching hell out of them. Somehow, it all works. If you played Saints Row 4, the last big game from developer Volition, you already know the basics of Mayhem's combat system: leap and strafe in third-person, use conventional-ish weapons and special abilities to kill dozens upon dozens of enemies (or civilians if you want, which feels a bit weird here since you're supposed to be heroes instead of a megalomaniacal street gang). Mayhem layers several new complexities onto the base of Saint's Row skirmishes. First off, you now control a hand-picked trio of heroes, each with their own weapon and special moves. Switching between heroes is immediate and fighting well means taking advantage of their differing strengths. It feels damn good to flow between Braddock's long-range rifle, Fortune's gap-closing dual pistols, and Scheherazade's close-up scimitar, just to cite one of my favorite squad lineups. I also like that their celebrity triad name would be Bradforzade. Through a strange twist of canon, Agents of Mayhem is a direct sequel to Saints Row: Gat out of Hell (or to one of its endings, anyway, it's a whole thing). But it takes place in a separate universe, so you don't need to roll with the 3rd Street Saints to appreciate the story. Still, longtime fans will enjoy sly references and a few recurring characters; Kingpin and I go waaaaaay back. The battlefield itself can be more tricky to follow. Red circles that show dangerous area-of-effect attacks are easy to miss - particularly when they're right underneath you - and the array of buffs, debuffs, and enemy abilities that often come up within seconds of one another can be both visually and mentally overwhelming. Seriously, I counted eight different kinds of debuffs that my aforementioned squad could inflict and I still have no idea what half of them do. Clumsiness aside, no situation was ever unmanageable as long as I stuck to the recommended difficulty setting. Most of the playable characters are fun and memorable, especially the ones who subvert action hero stereotypes: Braddock is a gruff drill sergeant, sure, but she also feels responsible for the troops she may have pushed too hard into evil's waiting arms; Scheherazade is both an enigmatic ninja and a paradoxically personable storyteller. Other characters like Red Card, the hulking German who never shuts up about his favorite football club, are less likable. But you can just send him out on timed away missions and reserve your squad slots for the cool kids. Mayhem also deserves praise for being much more inclusive than its old cartoon and action movie source material; I was pleasantly surprised when I realized all three of my favorite squad members were women of color, with at least one LGBTQ representative present. How many other big games does that sort of thing just accidentally happen in? Agents of Mayhem is very funny, too, and in that respect too it's a direct successor to Saints Row. Watching Volition find its comedic voice throughout the Saints Row series was a pleasure and in Agents of Mayhem that voice truly sings. Or, uh, does stand-up, or whatever. The missions that follow cliques/sub-teams within Mayhem, like "Franchise Force" and "Carnage a Trois", are particularly good. They make room for the banter and camaraderie between main characters that other parts of Mayhem - which must allow for interchangeable heroes - often lack. Small touches like the recurring specter of Carol from H.R., a bureaucratic boogieman mentioned in several conversations, also provide some grounding and levity. Think the office scenes in Archer and you're just about there. When I was supposed to be gearing up for the final confrontation with Mad Scientist Guy, I was secretly hoping to fight those color-coded, Hatsune-Miku-like AI quintuplets again. Outside of Mayhem's levitating ARK headquarters, the main campaign is divided into "episodes" that each focus on taking down one of LEGION's evil overlords. Unfortunately, the two villains who begin and end the campaign (Hammersmith and Dr. Babylon, respectively) are also the least interesting. It's a shame to lead with boring old "I build lots of weapons because I like to build weapons" guy while an obnoxiously manipulative Justin Bieber pretender is ready to take the stage. And I'll admit that, when I was supposed to be gearing up for the final confrontation with Mad Scientist Guy, I was secretly hoping to fight those color-coded, Hatsune-Miku-like AI quintuplets again. As it stands now, the campaign's sorta-satisfying conclusion feels designed to directly lead into DLC expansions or sequels. Whether you're on a mission or just hunting down dark matter shards (which you can collect to upgrade your Agents, thanks Crackdown orbs), you'll spend ample time in the open-world environment of near-future Seoul. The city has a vibrant, utopian aesthetic with glowing high-rises in one block and ancient temples and flowering cherry trees in the next - all the better for LEGION to spoil with imposing fortresses and doomsday devices. I was pleasantly surprised by how the effects of these sites bleed into other parts of the game; several missions were tougher because of nearby LEGION artillery that I could have taken out ahead of time. Or maybe I did deal with them already and they just came back online, since LEGION can retake captured sites. This could feel frustrating for completionists, but it does mean you'll always have something to do out in the world and several ways to earn new stuff via the MMO-inspired loot system (it encompasses everything from new hero skins and gadgets to additional cars). Minor activities like races and impromptu attack targets aren't worth seeking out on their own but can be nice diversions between bigger things. All that above-ground action doesn't quite make up for how repetitive LEGION's secret subterranean lairs feel. Okay, yeah, an evil empire would use some recurring architectural motifs. But I fought through enough robot factories and trap-ridden control rooms to subjugate every South Korean man, woman, and child at least 10 times over. Probably a quarter to a third of my overall time with Mayhem was spent in underground bases so a little more variety there would have been welcome. Variety is something that Agents of Mayhem otherwise has in abundance, thankfully. Whether you're in the mood for action-packed battles on crowded concert stages, upgrading your agents and home base, or going for some breezy, triple-jumping platforming between skyscrapers, new fun is never far off. Then you can return to base, slot in a different trio of heroes, and drop back into Seoul with an all-new team. Mayhem is flawed, but it's also a strong start for an enjoyable and funny series. Would it be presumptuous to say I'm ready for season two?